Why are these people smiling? Hint: the answer begins with a 2. 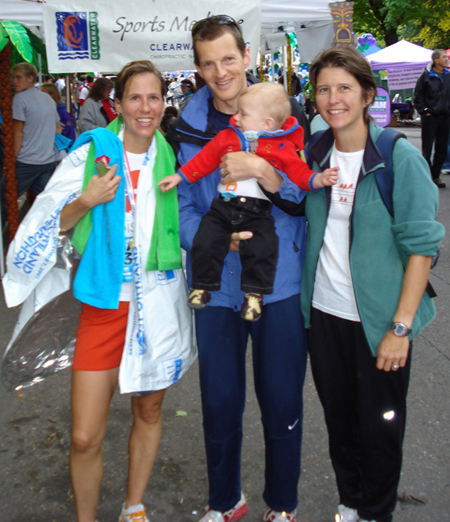 Our friend Sally Bergesen (at left) ran her first sub-3:00 marathon in Portland on October 7th. Her official gun time was 2:59:27. One could say that Sally did this the smart way, running nearly even half-marathon splits of 1:28 and 1:31. One could also say that she did it the hard way, racing after two full days on her feet at the pre-marathon expo, where she was selling women’s running apparel. You see, that’s the sort of priceless wisdom she can count on from me, her unofficial, extremely part-time quasi-coach. What I do, basically, is make up workouts for her and Liz about once or twice a week. I don’t do an especially good job of this; I just try to give them some variety and get them to run fast without forcing them to work much harder than they want to. I think of this as the “First, do no harm” approach. Avoid turning an enjoyable activity into a miserable one, and let the athletes’ own interests and motivation take them where they want to go. I’ll take a bit of credit for not making Sally miserable. Beyond that, the credit should go to her and her trusty training partners. Greg,The value of the unofficial, extremely part-time quasi-coach role should never be underestimated. You, and Liz, and even LP were a huge part of the equation. Also, as we've discussed, it's interesting to note that the more rigorous "program of pain" training we did in the lead up to NY 2 years ago yielded less positive results. Although there are many factors that may have contributed to a better Portland race, I like to think that it's due to a shift in our thinking…that running has become a support system for life rather than the other way around.Again, thanks for everything. You've not only done no harm, but quite a bit of good as well. B. Bergesen: Sally and I are happy to publicly acknowledge your critical role in the achievement of the sub-3 milestone. We did not do so earlier because we assumed that Sally's personal, private thanks would be more gratifying than a blurb in an online medium that, by your own admission, is foreign to you. But now that you've revealed your deep-seated need for publicity, I'll gladly corroborate your account so that you may rightfully enjoy the adulation of dozens of anonymous readers — most of whom undoubtedly wish that they had a father like you.